Left: Yagub Madatov, Director, who has worked at the Archives for the past 35 years during which time the collection has gathered more than 50,000 voice items related to Azerbaijan's history. Photo: Blair. Nothing from history speaks to us quite so profoundly as the human voice itself. Reading handwritten pages of thumb-worn diaries or looking at faces in a photo albums may be revealing, but there's something much more immediate and personal about listening to the sound of a person's voice. Recordings of the voices of many famous Azerbaijanis are housed at the Azerbaijan Republic State Voice Recording Archive, including those of composer Uzeyir Hajibeyov (1885-1948), Tabrizi poet Shahriyar (1907-1987) and the founder of the Azerbaijan Democratic Republic, Mammad Amin Rasulzade (1884-1955). Also included in the archive's 50,000 - plus audio recordings are well-known khanande [traditional singers] from the early 20th century. Here Yagub Madatov, Director of the Voice Recording Archive, explains how he and his staff have put together this unique archive as a way of preserving historic recordings for future generations. Left: A 19th-century thick cardboard record made for a German manufactured recorder called the Hemophone. This record is a Strauss piece and belonged to the writer Akhundov (1812-1878). The Archive has no Hemophone and archivists working there have never heard this record played. Photo: Blair. Our generation is familiar with Azerbaijani greats like composer Uzeyir Hajibeyov (1885-1948), singer Rashid Behbudov (1915-1989) and poet Samad Vurghun (1906-1956). But we need to ask ourselves the question whether 50 years from now, Azerbaijanis will be able to remember anything other than their names? Such personalities are a vital part of our history, and it's up to us to enable future generations to remember them. Here at the Voice Recordings Archive, we work to preserve Azerbaijan's culture, art and history through audio recordings. These recordings represent living history. And who knows? Some of them might hold valuable information for researchers in the future. Naturally, we try to archive everything. Our archive was created according to a governmental resolution that says we cannot delete anything from the archive. Already, we have more than 50,000 audio recordings related to Azerbaijan, including vinyl records, cassette tapes, CDs and some videos. Especially rare are the archive's 500 or more vinyl recordings of classic mugham singers from the early 20th century that were recorded between the years 1902 and 1914. 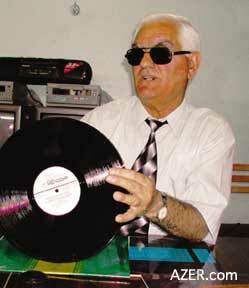 The Azerbaijan SSR decided to open up its own Voice Recordings Archive back in 1968. Another such archive had been opened in Moscow the previous year. Called the Voice Recordings Archive of USSR, it served as a repository for recordings from all over the Soviet Union and included the voice of every performer who had ever been honored as "People's Artist of the USSR" and every deputy of the USSR Supreme Soviet. Our archive, on the other hand, focused specifically on Azerbaijan. To this day, none of the other former Soviet Republics have opened an archive like ours. Today, the Voice Recording Archive is the most recent of seven archives functioning under the umbrella of the Head Archives Department under the Cabinet of Ministers of Azerbaijan. I was fortunate to be involved with the archive from its very creation, along with several other enthusiastic students who had been recruited from the Azerbaijan (now Baku) State University and the Academy of Sciences. We started everything from scratch nearly 35 years ago. At the time, our main source was the recordings of the State TV and Radio Company. We had our pick of the programs from whatever was shown on television. According to the governmental resolution, the Radio and Television Archive would make a copy for themselves and then send us the original document for official preservation. We also carried out research in Azerbaijan's various regions, where villagers are recognized for their deep knowledge of folklore. We found examples of laylas (lullabies), folk tales, meykhanas (the Azerbaijani version of rap) and dances from each region. Left: Much of the sound equipment in the Archive is decades old and quite outdated. We also interviewed famous Azerbaijanis, including heroes of the Soviet Union, heroes of Socialist Labor, Academicians, "People's Writers" and "People's Artists". This was during the Soviet era, so we didn't focus on politics or the government. Instead, we asked the people to talk about their own interests, about their lives and creations - what they really felt inside. From their voices, you can tell that the answers were sincere. I've been doing this type of work for more than three decades, and from my experience, I've learned that the voice affects the way one thinks. For example, if you hear a very smooth, nice voice, you take it for granted. But if you work with the sound of that voice for a long time, just hearing someone else being rude to a child can hurt you. For example, every time I hear the voice of Hajibeyov or Vurghun, it sounds like music to my ears. But if I go to the street and hear harsh words, it's painful to me. The people around me know that I'm a very sensitive person. A single word can pain me. A very exciting part of our collection features the recordings of khanande from the early 20th century. For instance, we have a 1908 recording of Kechachi oghlu Mahammad; he had a very unique voice. There is also one of Jabbar Garyaghdi oghlu, who was the most famous of all Azerbaijani khanandas. 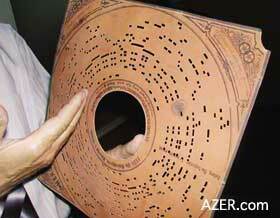 These were recorded here, manufactured in France, England and Poland and then brought back to Azerbaijan. Some of these recordings have been restored and transferred to compact discs. This process is very complicated. Suppose we want to create a series of recordings by singer Shovkat Alakbarova (1922-1993). She has vinyl records of varying quality - for example, the quality of her records from 1960s invariably are superior to those made in the 1950s. We have to re-record them on a tape so that the final recording is of equal quality. After we enter these recordings into the computer, we create CDs. We don't sell these CDs; we just store them here and make them available for listening. One of the oldest objects in our collection is a cardboard record that once belonged to writer and alphabet reformer Mirza Fatali Akhundov (1812-1878). This recording is of a polka - mazurka and a fragment from the Strauss opera "The Gypsy Baron"; it was created for a German-manufactured record player called a herophone, which is now obsolete. We know that the record was once part of Akhundov's collection because it has his handwriting on it and came to us from his home museum in Shaki. Unfortunately, we can't play it because we don't have a herophone. Researchers are welcome to visit and listen to the recordings here at the Archive. We simply ask them to bring a letter that describes the topic they are working on. We have two kinds of catalogues, one organized by name and another organized by general category. We also have specific collections, such as the Uzeyir Hajibeyov collection. Above: Part of the Voice Archives Collection on display in a small exhibit room. Poster is of Rashid Behbudov, famous singer from 1940s to 1980s. 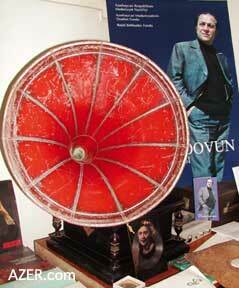 Early gramaphone and plastic record. We moved into our current building in 1995. It has eight stories, five of which are used for storing the recordings. The building was designed specifically to be an archive. Right now, we have 18 employees. We are not able to fully utilize our work resources because we have limited equipment. For instance, our sound equipment is quite obsolete; some of the tape recorders date back to the 1960s. We only have one computer, which is used for both administrative and archival tasks. Obviously, not all of the employees can work on the computer at the same time. Even having just one more computer would be very helpful; then we would be able to employ more people and get a lot more work done. Despite these frustrating challenges, we still feel a deep responsibility to help preserve Azerbaijan's culture, art, history and literature. By continuing to expand the collection and preserving these voice recordings to the best of our ability, we give future generations of Azerbaijanis the opportunity to listen to these rare recordings made so many years ago. Yagub Madatov is the Director of the Voice Recording Archives where he has worked for the past 35 years. 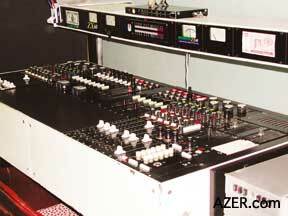 The Voice Recording Archive is located at 168 Azadlig Prospect, Baku. Tel: (994-12) 63-02-94. The Discography Web site of the Voice Recording Archive is at DISKOGRAPHIA.aznet.org. This site (in English and Azeri Latin) lists more than 500 examples of Azerbaijani folk songs, mughams and folklore that were recorded between the early 1900s and 1950s.